This is a new development. Is fully furnished all new. All you need to bring is the clothing you want and beach towels and buy what you want more of. Boat slip available. Pool and hot tub just steps away from terrace area, exercise room. Granite countertops just a few of the luxury setup, ice and water. Fridge. Central air. What can I say a great vacation place. Rentals close by. This is paradise at a fraction of the cost. Everything in this unit was picked out for your comfort and a great holiday. 3 queen size pillow top beds with the best linens for superb comfort, large stainless steel barbeque, and electric rotisserie. Hard wood floors in the main living area and master bedroom, electric fireplace, leather furniture, 42 LCD in main living area, with a 32' in master room, 26' LCD in the other 2 bedrooms all with DVDs, I-pod alarm clocks in all bedrooms and much more. 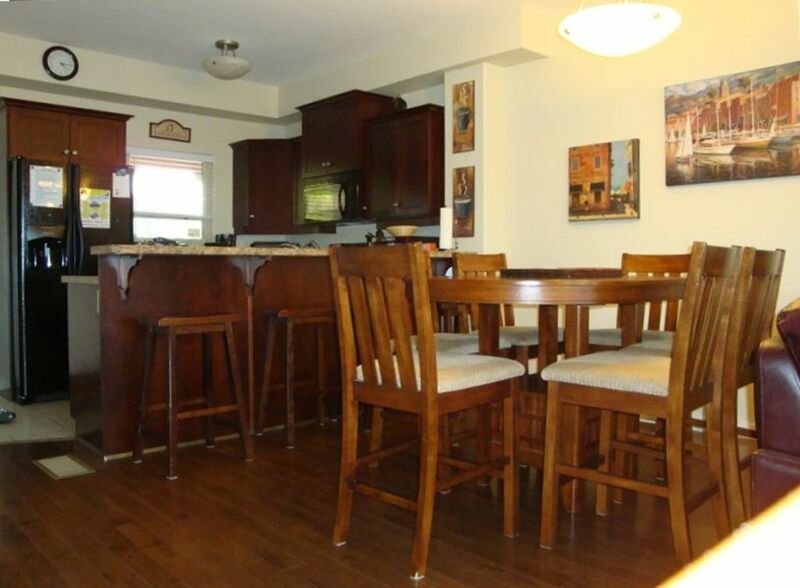 Kitchen has it all with 4 bar stools at the counter, coffee bean grinder and maker, toaster oven and toaster, slow cooker, electric carving knife, Normal blender for those special drinks or the bullet blender for those individual specials. Surround sound stereo to relax if that what you want to some music or a good movie. Of course washer and dryer, dishwasher, stove top microwave, iron and board. Reverse osmosis water system for fresh water and ice, water softener. Lounge chairs and beach chairs, with a small bar fridge for outside when your relaxing and have the colds ones close by. A view to die for and relax with a cup of coffee in the morning or at night, a glass of wine the night time view is awesome. This is the second year this unit is available and last year was fully booked with many coming back, not leaving a lot of open time. So make the plunge and you will be happy you did, luxury at a fraction of the cost. Lots of choices of all types in restaurants. Grocery stores, bathing suit shops, cafes and many other types of shopping stores close by. Wineries too many to mention, days could be spent just on this area alone. More shopping 40 min. to Penticton. US border minutes away. Many golf courses to choose from close by for those with more friends, a unit beside is also available. Osoyoos lies in the center of Canada’s only desert and boasts its own climate zone—the “Osoyoos Arid Biotic Zone,” producing delightfully hot, sunny summers and pleasantly mild winters. Osoyoos claims the warmest freshwater lake in Canada as well as the lowest annual precipitation and highest annual temperature. A spend alot of time in Osoyoos, and love the dry and hot climate Osoyoos is famous for. I set my place up just like I was living there, hence all the needs a Person would want to spend a week or weekend and relax. Kitchen is fully equiped, with everything you would have at home. A great view durring the day of the lake and spectacular view at night. large dock area and pricate swimming area, public beach area just beside waterfront area. We were 2 families totalling 6 people sharing this unit (4 adults and 2 kids), and our other friends rented the unit next door. It was definitely more spacious than it looks in the photos (approx. 1300 sq. ft) and had everything we needed. We didn't need to worry about aluminum foil, cling film, coffee, sugar, salt & pepper, Pam spray, all the little things were provided by the townhome. It was very well stocked and had enough plates, cups, glasses, cutlery for at least 12 people. Our friends came over for dinner - 8 adults around the dining room table, and 4 kids around the coffee table - it didn't feel cramped at all. It was a relaxing 4 night stay over the May long weekend. The property was conveniently located near the lake, and has a swimming pool and hot tub which is where we spent most of our afternoons to cool off from the sun. The weather was perfect and the property had wonderful lake views. We were fortunate that no-one else was checking in the day we were leaving as Terry was very accommodating, and allowed us to check out later to ensure we had enough time to clean the bedsheets and towels etc. It's actually less work than we thought. We even had enough time to have one last dip in the pool before we left! Overall, our friends and I will definitely return to this property as it was a home away from home. The accommodation was extremely affordable. Thanks Terry, you have a lovely home! I always do my best, to ensure a great holiday. sounds like mission accomplished. Again my place is setup as a home with everything there to make the holiday as best as possible. Small details add a lot! My husband and I and our teenage son just spent 3 nights in this condo. It is a nice layout with the three bedrooms on the ground floor making them cooler than the upstairs which is great for sleeping. Terry has thought of many little details that make staying here a pleasure - a well stocked kitchen including a salad spinner, blender, smoothie maker, etc., a movie library, a stash of books to read, and games. The beds are very comfy, the place was very clean and well kept. We would highly recommend it. The property is well kept and the pool and hot tub look inviting. We totally enjoyed staying at your condo. The layout was perfect, the view and balcony were wonderful. You made it feel so homey with all the details one would need at home - even a garlic press! Having to cook most of our meals due to allergies, it was a treat to find the kitchen well stocked with everything you would need. This is by far one of the nicest condos we have stayed in. Thank you, Terry, for being so attentive and making us feel welcome. You are so welcome Gordon. We are glad you enjoyed your stay. Osoyoos is such a beautiful vacation spot and we want your stay to be perfect! We have stayed in other VRBO rentals in the last few years and have never felt the need to write a review about any of them before. This one was totally different. From the time we walked through the door, it felt like home. The layout was great, the view was fantastic and the location was perfect. The condo had everything that we needed and more. We couldn't believe the thoughtfulness of Terry by providing absolutely everything that we needed to have a wonderful vacation. The condo was very spacious and comfortable, and being so close to the pool was awesome. It was without a doubt one of the most relaxing and enjoyable vacations we have had . Thanks Terry, we hope to stay here again soon.